Finely dice onion and mince garlic. Peel ginger and finely mince. Next, cut pumpkin and bell pepper into cubes. Halve cherry tomatoes. Peel sweet potato and cut into equally sized cubes. Heat olive oil in pan over medium heat. Sauté onion, garlic, and ginger for approx. 1 – 2 min. Next, add cubed sweet potato, pumpkin, and red pepper. Stir in tomato paste, curry powder, and curry paste. Season to taste with salt, pepper, and chili flakes. Continue to sauté for an additional 3 – 5 min. Add coconut milk to frying pan and stir thoroughly. Bring to a boil, then reduce heat and allow to simmer for approx. 10 – 15 min. until tender. Roughly chop mint and basil. 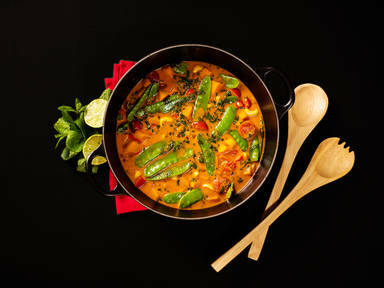 Add cashews, cherry tomatoes, and snow peas to frying pan. Stir thoroughly. Squeeze juice from lime and add to the curry. Gently stir in mint and basil. Serve with rice or bulgur and enjoy!